James Juniur Dougan was born in 1864 in New South Wales, Australia, the child of Irish immigrants. With his family he emigrated for Victoria, moved to California, and returned to Canada in 1876. Before he moved to Maple Ridge, James Juniur was a teacher in Vancouver, having trained through correspondence with Queen’s University. He later sat as a governor for the McGill University College of BC, which would become the University of British Columbia. He also took up other community service roles and participated actively in Conservative politics. 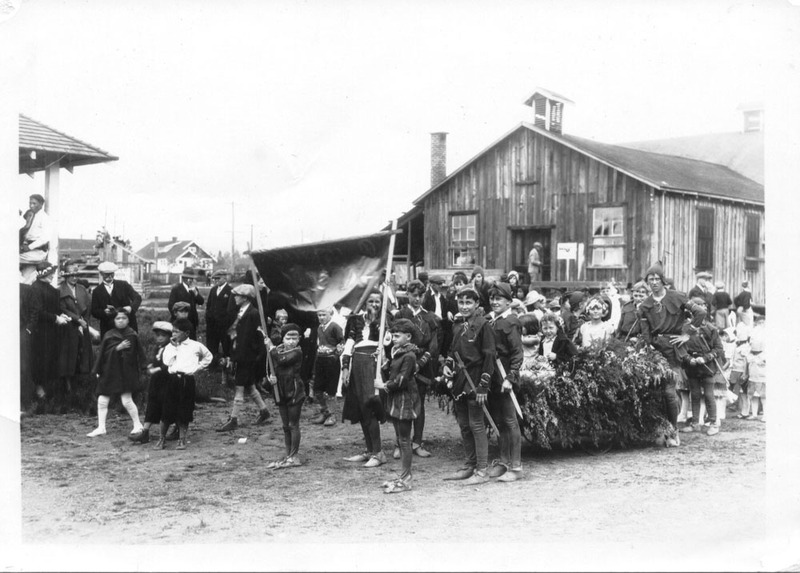 JJ Dougan, third from left in the light coloured cap, observes the May Day parade float from Hammond School at the Agricultural Hall in Haney. Dougan was a passionate supporter of education and community development. James Juniur’s passion for education continued throughout his life. While running the newspaper, James worked as “promoter and secretary” for the BC School Trustees’ Association where he found positions for teachers throughout the province. In 1932, James Juniur died suddenly at the age of 68. It was Halloween, and Dougan had stayed late at the Gazette office to hand out candy to children. Afterwards, he went to the house of Dugald Brown to attend a meeting of the Jersey Club. As reported by the United Church Reverend Peter Henderson, “[…] after his usual hearty greeting to all in the room, he suddenly collapsed from a heart attack, and in a few moments those present realized that he was beyond the reach of mortal aid.” Dougan’s assistant, Ivan Hambly, took over operation of the paper upon Dougan’s death. James Juniur was missed by many. As a result of his notable life and large personality, he received funeral ceremonies in Maple Ridge, Vancouver, and Cobble Hill on Vancouver Island. Dougan is buried on family property on Vancouver Island.